Our computer is now running smoothly again (new video card + new power supply installed on the weekend) so of course I had nothing better to do than start playing a new game on…the PS2! It’s Persona 4. I really really liked Persona 3, especially because for its story, and although I only played Persona 4 for a few hours, I think I’m going to really like it, too. The main character, the character you play, is a male teenager. He just transferred to the small, tranquil town Inaba from the big city where he’s going to live with his uncle for a year because his parents took a job overseas. Only, the town isn’t so tranquil anymore. Strange things are happening and two persons turn up dead in mysterious circumstances. Persona 4 is centered around a mystery. Who and what’s behind these murders? The police doesn’t look like they could be much help because the murders seem connected to an alternate world that exists besides the real world and is accessed through TVs, something the police would have trouble believing. The first hours are very much like a movie. Lots of story and the first battle doesn’t happen for well over an hour. I can’t wait to find out what happens next in this game this evening. I don’t feel much like blogging since I’m back from vacation. And I’ve only finished one book. But: last weekend, I started to play again! 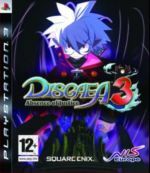 It’s not Prince of Persia: Warrior Within – though I really plan on finishing it – I’m playing Odin Sphere right now. 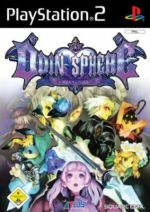 Odin Sphere is an 2D action fantasy RPG and comes with five stories. Each story has a different protagonist though the stories overlap and are connected by an overarching story. 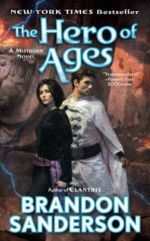 A protagonist may turn into the antagonist in another story. I’m really interested how that turns out and hope for a rather deep/developed story line. I haven’t played a lot, I’m in the first story, but so far I have fun. I like the graphics and 2D means the characters can only go left or right. Nice “old-school” touch. The areas/levels are circular and you have to clear all enemies before you can proceed to the next area when you’re in a combat level. Then there are levels where you can shop and of course minor and major boss levels. Also: Odin Sphere has an alchemy system and gameplay elements to level up the power of your weapon (gaining more magic skills that way) and to increase your life points. I’m also playing Pirate Galaxy. It’s a MMOG (massively multiplayer online game) and – important! – it’s free. You don’t even have to install software on your PC, it plays in your browser. I signed up a few days ago because it has a science fiction setting. You’re playing a pilot who’s hunting aliens, called Mantis. They invaded the whole star system, there are different kinds, and it’s up to you and the other players to do something against that. There are story missions and secondary missions. You mine Cryonite to buy improvements for your ship (for which you first need to find the blueprints) or to buy new and better ships and you have to refill your energy by sucking up floating energy balls. Pirate Galaxy is my second foray into multiplayer games. So far, I have fun playing but it already looks like the missions get to difficult to do on my own (I’m also not a really skilled player). I like playing in groups but I also find it a bit frustrating that the missions are becoming too difficult to do on your own. It turns playing for fun into work: you have to find other players who need to do the same mission as you (and who want to play with you or you with them). Of course, you can just fly around and shoot on Mantis’ ships but despite that you level up that way, it seems a bit pointless to me. The game is fun to play but it isn’t that great so I like to have something to do. I was doing a mission when another player showed up. My mission: I needed to kill a fixed number of Mantis and had a time limit for that. He helped me with two of them, probably because it looked like I was in trouble (which probably was true) and then wanted to know why I didn’t take what one of the killed Mantis had dropped. Well, I was busy and because he had a higher level than I, I was intimidated and didn’t want to take it. He did kill one of them, after all. He kept on chatting and so I was busy, killing Mantis, trying to figure out the chat programm – I’m polite! – and trying not to get killed while I was at it. When he got that I did a mission he left that area. A bit later he asked if I needed help but then I was finished and had succeeded so I said no. I then thought about if I should go back to the orbit or refill my energy. I decided on the second and stayed on the planet. The problem with that plan was, the Mantis respawned and four of them were closing in on me. Too much! I hightailed it but they followed and got me a bit later. I thought a woman in her thirties who played an MMOG would be too much of an oddity. The next day, I was in a scrape again with some Mantis. A female player showed up and helped and we killed some Mantis together for a time. Then later, the other player showed up and asked if I’d played with that female player. I did #1, and for whatever reason, I kept playing. Because right after the fight, one of those damn Dahaka chase sequences starts. I hate them. But after quite a few tries, I manage it. I’m all YAY! and I’m looking around for a save point. After the second chase sequence, I checked a walkthrough and I knew that after the fourth chase sequence, it’s just a matter of climbing up on a platform and two jumps to a balcony. There, behind the waterfall, is my save point. So I won’t quit because doing all that again? NO WAY! Thanks to the damn chase sequences, I’m playing for more than three hours now. Like always, I have trouble to get the timing of the moves right, like jumping from pole to pole or running along the wall and graping a rope, and because I’m chased, I only have one try. One mistake and the Dahaka gets me. Then it’s game over. This is so not fun. I know I’m not the best at these kind of games and my reaction time is not the fastest but seriously, I can’t imagine managing these chase sequences on the first try. Even if you’re better at the moves, you just don’t know where you have to go. My nerves are wrecked and I seriously need something to eat. Like chocolate. But we don’t have any in the house. And then finally, I manage the forth chase sequence and the platform raises and I’m giddy from excitement and exhaustion and I climb the platform. And run into a glitch! I can’t get onto the platform because there is some kind of invisible wall, with one of the ledges used to climb the platform floating on thin air. That’s bad. That’s seriously bad. Because it means that I CAN’T GET TO MY SAVE POINT which is just two jumps away if only I could get on that damn platform! It’s more than four hours ago that I started to play and fight the empress, perhaps it is even closer to five hours, I don’t know and I don’t care because I can’t do a thing except turn off the PS2. But what really gets me is that I don’t know if it will happen again because I don’t know what caused the glitch. It could be I did something “wrong” during the chase sequences, or it could be my save file is corrupted and I’ll get the glitch EVERY TIME. I don’t know if I’ll try again. During my search for help with my glitch, I also found a video on youtube with the four chase sequences. In less than 10 minutes! I’m off to eat some chocolate. The Boyfriend went and got me some. As for writing a book comment and reading? Forget about it. I’m done for today. I did it. It only took me about 20 minutes this time and 7 failed tries (5 of them for the third chase sequence). It’s just considerably easier when you know where you have to go. It also payed off that I finally had the swinging-on-a-rope-then-running-on-the-wall move down pat after yesterday. And I didn’t encounter the glitch! Everything went how it should be and I could get on the platform and save. The thing I did different? I changed the order of the last two chase sequences – the long one before the short one. Puzzle Quest: Challenge of the Warlords is available on all kinds of platforms. It also comes with different playing options: Single-player, Multiplayer, or Instant Action. Only the single player option follows a story line. 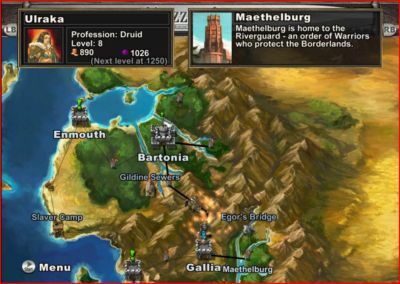 It offers different types of heroes and heroines and you can gain companions who can give you bonuses in battles. There’s no animation and voice acting, relying on pictures and text to tell the story, so it’s far from what is standard in games today. Although there is a soundtrack at least. 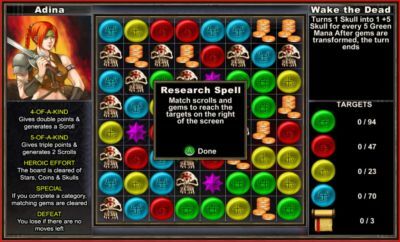 Puzzle Quest: is a puzzle game using the well-known match-three formula and elements from role playing and strategy games, and combines them all with an ongoing good vs evil story. At the start of the game, the player’s character sets out with a small errand but soon it becomes clear that more is at stake: the evil Lord Bane is up to no good and it’s up to your character to save the world. 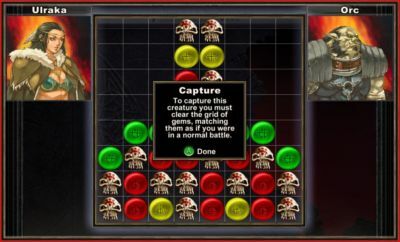 To achieve that, you fight battles in match-three (or more) games, using either spells or you match three skull icons to reduce your enemy’s hit points. For each battle won, your character gains experience points, and with each level up, you’re able to improve skills. You also gain money from fights and either spend that on new items or on improving your skills. 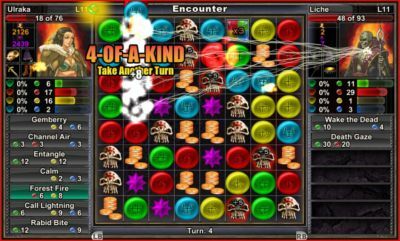 In addition, various twists are added to this match-three formula for different tasks like capturing creatures, learning spells, level up your mount, or creating better weapons and armors. ♦ I like match-three style games and so I was good with that. 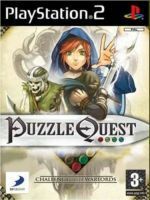 Where Puzzle Quest really shines is using this formula and adding to it. when you want to capture an enemy, you have to clear the grid by matching three. for researching spells (from the captured enemies), you have to match a certain quantity of icons and produce a certain quantity of scroll icons (by matching four or five other icons) to learn that spell. The higher the quantity, the more difficult it gets because when no more match-threes are possible, you fail to learn the spell and need to start anew. Then there are timed matches (you only have a few seconds to make decide on your move), and for creating items you need to find runes and forge three of them together by producing a certain quantity of hammer & anvil icons. ♦ I also like that you can play just for a few minutes or as long as you can take it. ♦ Because of the way it was presented, I didn’t follow the story line too closely.